Fire red paisley for a Celtic summer: The haunted house at Parc, near Afon Crosesor, where ghostly things happen all the time. Wild red flickering skirt, paisley and red gold organdie blouse with gold Turkish bodice. Skirt, blouse and top to order from Thea Porter. Fire red boots by Elliott. Sash pin from Ken Lane. Amber beads ,wrist scarf and long red scarf by Ascher. 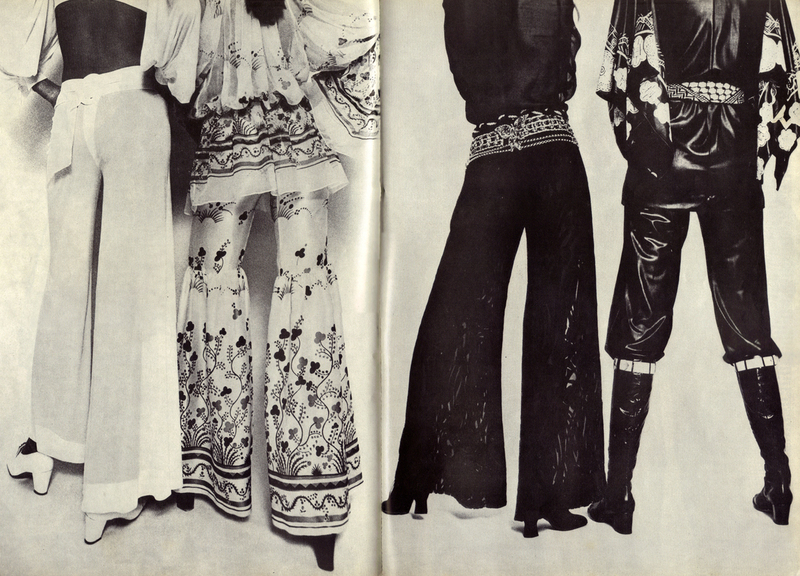 Scanned by Miss Peelpants from Vogue, July 1969. 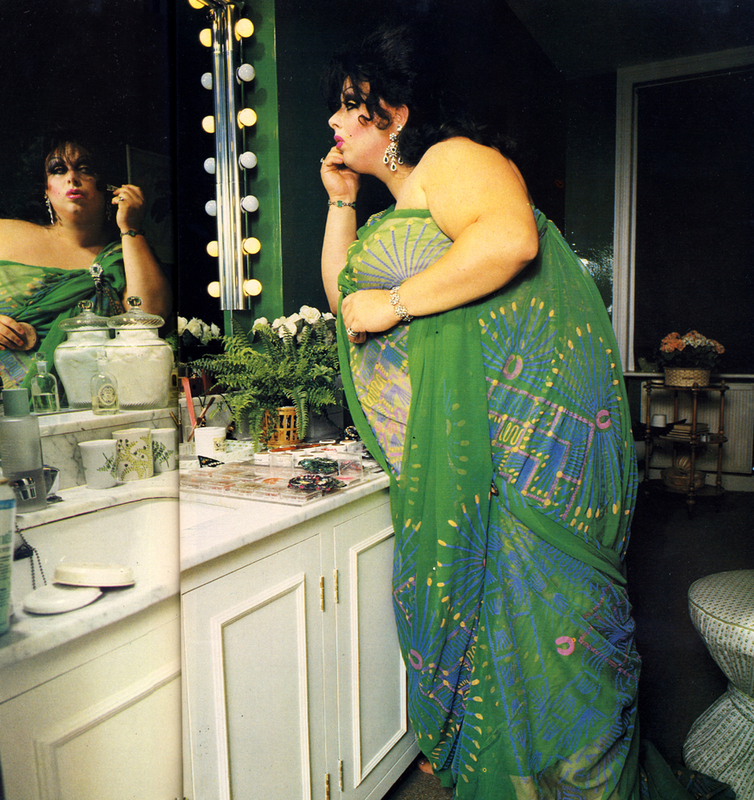 Divine at his toilet, using On-Stage make-up available from Nina Campbell. His toga is Zandra Rhodes printed silk, ‘Mexican Turnabout’. Bracelets and brooch by The Purple Shop, 15 Flood Street. Rings and drop earrings by Adrien Mann, small diamond earrings by Ken Lane, brooches on washbasin from Andrew Logan’s Galactic collection. Make-up by Richard Sharah, wigs by Wig Creations. 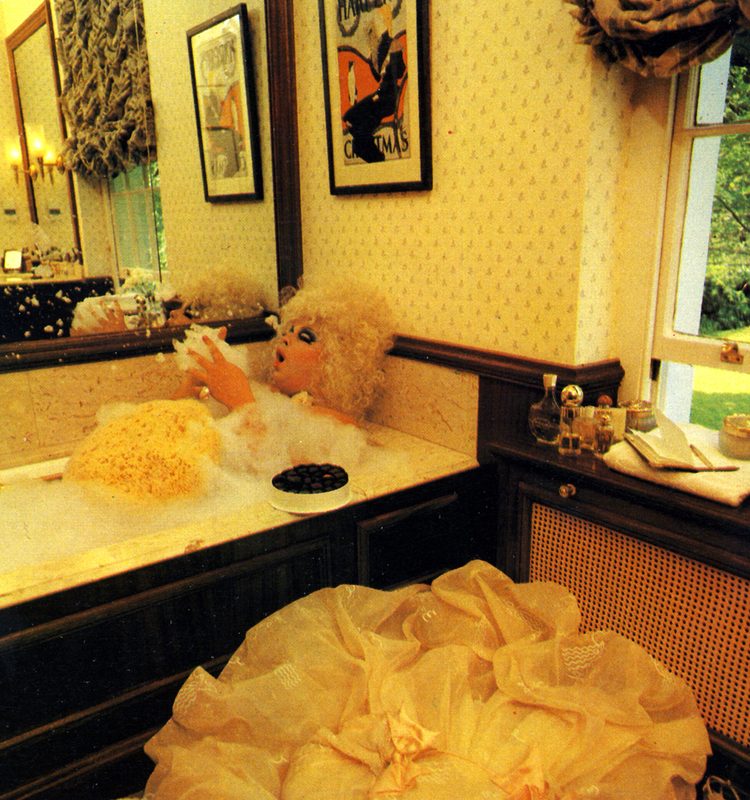 Divine bathing in Jean Harlow mood. Abandoned ball dress by Zandra Rhodes. Shell ring by Andrew Logan, £40 from 15 Appold Street, EC2. Chocolates by Charbonnel et Walker. Tom Parr of Colefax & Fowler, 39 Brook Street, W1, designed this St John’s Wood bathroom. Double mahogany doors open into the room, with large windows on two walls panelled to dado level with mahogany. The festooned windows look out on to a garden. Bath and basin are topped with marble, taps are Edwardian reproductions by Czech 8 Speake, 88 Jermyn Street, SW1. 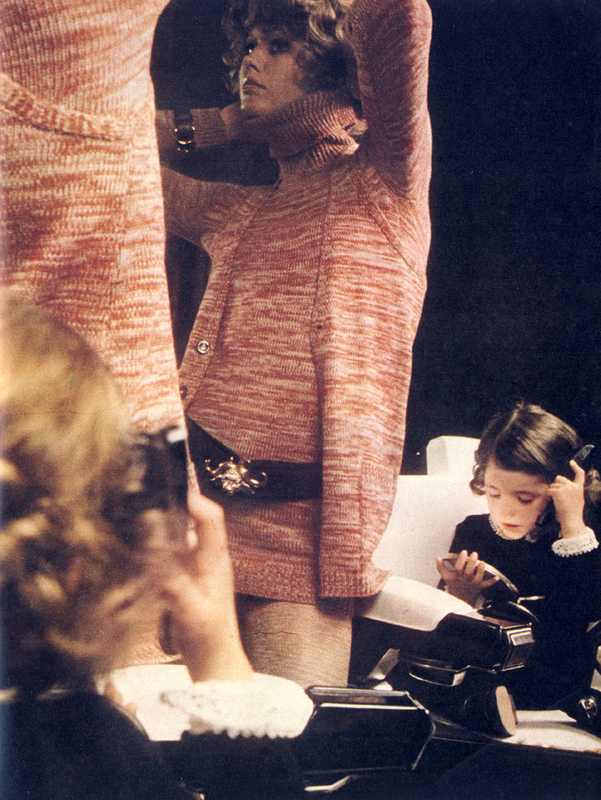 Scanned from Vogue, June 1976. Photographed by Barry Lategan. Modelled by Jerry Hall. Dress by Yuki. Jewellery by Ken Lane. Dress by Nettie Vogues. Sandals throughout by Manolo Blahnik at Zapata.